The Canadian Horse Racing Hall of Fame has announced it will recognize a world champion, world record holder, and household name of over 100 years ago - pacer Dan Patch as its 2019 Legend. The most famous pacer of the early 1900’s he won all 73 races he contested and attracted large crowds of fans at his appearances in both the US and Canada. Dan Patch was a horse for the ages and much admired. He set records in races and time trials throughout the US, earning the titles “The greatest harness horse in the history of the two-wheeled sulky” and “World Champion Harness Horse”. 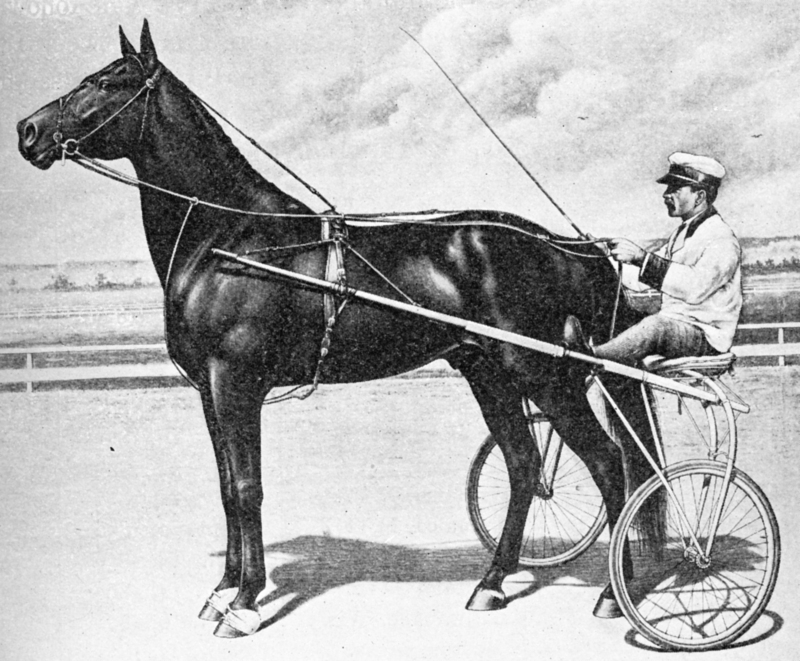 In the fall of 1906, Dan Patch paced a time-trial mile in 1:55 1/4 in Lexington, an almost unbelievable record that would stand for several decades. To place his record in perspective, the first Canadian horse to go faster than two minutes flat in a race (2:00.00) was Mighty Dudley in 1959. The Canadian Horse Racing Hall of Fame’s decision to honour Dan Patch’s exploits is a result of the Canadian portion of his career and the role he played in Canadian harness racing history. The Hall of Fame continues to expand its reach to honour all racehorses and people who have brought honour to Canadian racing and to Canada as a nation. On August 8th that same year, 118 years ago, Dan Patch faced three challengers, this time in Fort Erie, Ontario, and was again victorious in three straight heats, despite being taken to the back of the field in the first heat before exploding past his competition down the stretch for the win. The following year in June of 1902, Dan Patch returned to Windsor for a much publicized match race against Harold H, the best Canadian pacing horse of the time, defeating the Canadian challenger handily in front of thousands of admiring fans. Dan Patch made his final Canadian appearance at Toronto’s Exhibition Park October 21, 1905, two weeks after setting his world record in Lexington. He was then owned by Mr. Marion W. Savage, a Minnesota businessman and founder of International Stock Foods, a company that also had a Canadian operation located in Toronto. The Toronto time-trial garnered a Canadian record for a mile on a half-mile track of 2:06, breaking the previous record by three full seconds. Today, that record is acknowledged with a granite bench engraved with the words “World Champion horse ‘Dan Patch’ broke the Canadian record here in 1905”, located outside the north end of BMO Field at Exhibition Place. Throughout the first half of the twentieth century, Canadian restaurants, banquet halls, theatres and homes displayed memorabilia celebrating the exploits of Dan Patch. Canadians in all walks of life proudly recognized his exploits on Canadian soil. In many ways, he was an adopted son. During the teens-30’s of the 20th century it was difficult to find a Canadian youngster who didn’t know about Dan Patch and his exploits on the racetrack. For his time, he was as famous as any superhero and as well-known as the top celebrities of the day; truly the stuff of legends. Movies were made and books were written to chronicle his life and his on track achievements. There were few like him. The CHRHF first recognized Legend honourees in the year 2000 as a millennium project to acknowledge the contribution of people and horses to Canadian horse racing at least 50 years before the year of recognition. Activities relating to the honours bestowed on Dan Patch by the Canadian Horse Racing Hall of Fame are currently in the planning stages and will be announced in the coming weeks. The CHRHF reminds racing fans and participants that nominations for induction in 2019 to the following categories are still being accepted. * MALE HORSE: Stallions or geldings whose contribution to Canadian racing occurred in the past 20 years. * FEMALE HORSE: Mares whose contribution to Canadian racing occurred in the past 20 years. * VETERAN HORSE: Horses whose careers have been concluded for 20 years, but less than 50 years. * BUILDERS: Including, but not limited to Breeders, Owners, Officials, and others. * COMMUNICATORS: Includes, but not limited to writers, broadcasters, photographers, announcers. * VETERAN PERSON: Trainers, Drivers, Jockeys whose careers have been concluded for 20 years, but less than 50 years. All submissions will be carefully considered by the Nominating Committee of the applicable breed. Three finalists in five categories for Standardbreds and five categories for Thoroughbreds will be presented to the Election Committee for final voting by secret ballot. NOMINATION DEADLINE: WEDNESDAY, MARCH 6, 2019 5:00 pm EST.